There are dozens of attraction within walking distance or a short drive from The Sanders, Helena’s Bed and Breakfast. 1. Original Governor’s Mansion – Home to nine governors and their families between 1913 and 1959, this mansion now offers a unique glance into Montana’s past. Summer tours of this Queen Anne Victorian home are available almost every day. 2. The Cathedral of St. Helena – Built in 1908 and completed six years later, the Cathedral has fifty-six stained glass windows representing various Bible stories. Modeled after the Votive Church in Vienna, Austria and a cathedral in Cologne, Germany, the Cathedral is the seat for the Bishop of the Roman Catholic Church in western Montana. 3. Myrna Loy Center for the Performing Arts – Helena’s showcase for national music, theater, and dance companies, as well as festivals, conferences, and films. Originally the county jail, the building was remodeled and named for one of Helena’s favorite daughters – film star Myrna Loy. 4. Lewis and Clark County Courthouse – Built in 1885, this Romanesque building of native stone was the site of the first state legislative sessions. 5. Holter Museum of Art – At this new museum in an old setting, you’ll discover exhibits by local, regional, and national artists along with an excellent gift shop. Openings are gala events. 6. Grandstreet Theater – Built in 1865 as the Unitarian Church and later used as the local library, Grandstreet is the home for local live productions including musicals, drama, and children’s theater. 7. Historic Last Chance Gulch – Helena’s Main Street is home to many shops and businesses interspersed with plenty of history. Along this outdoor mall, one can find an old trolley car that was used until 1928, a sculpture of the Four Georgians, who were the first to discover gold on the Gulch, and a large number of historic buildings including the Power Block, the Atlas Building and the Securities Building. 8. 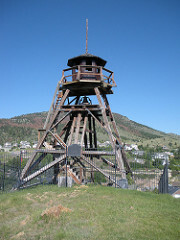 The Fire Tower – Nicknamed “The Guardian of the Gulch,” the Fire Tower is a symbol of Helena and of security. It is said to be one of only five urban fire towers in existence in the nation. 9. Reeder’s Alley – Now a location of small shops and offices, but in the 1870s it was the site of a brief gold rush. After a nugget worth $3.10 was discovered, the alley was filled with prospectors looking for gold. Unfortunately, no more was found. 10. Park Avenue – Walk along this stretch (which parallels Last Chance Gulch’s walking mall) especially if you are hungry (Mediterranean Grill and Park Avenue Bakery) thirsty (Blackfoot River Brewery local micro beer tasting room) and/or in the mood for shopping or looking for a book at the public library. 11. Mount Helena City Park – This 628 acre city park has a series of trails and connections with even more hiking and biking opportunities in the South Hills of Helena. 12. 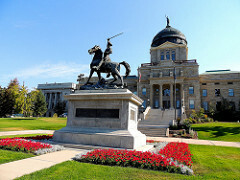 Capitol – After a hard fought battle between Helena and Anaconda, Helena was chosen as the capital city by a slim 2% margin. The building itself was built between 1899 and 1902 with two wings added in 1912. Look for the statue of Wilbur Sanders in the Capitol. 13. Montana Historical Museum – Wilbur F. Sanders helped establish the historical society and served as its president for 25 years. In addition to the archives, library, and historical exhibits, there are two permanent collections, the Mackay Gallery of C.M. Russell art and the Haynes Gallery of photography. 14. Last Chance Tour Train – This summer season train leaves from the west side of the Historical Museum, taking passengers on an hour tour of Helena attractions. This is a great introduction to our town. 15. Civic Center – This was the Shriners’ Temple until the earthquakes of 1935 badly damaged the building. Having no funds to rebuild, the Shriners sold the center to the City of Helena. The interior has been recently refurbished and it’s now the venue of many cultural events, concerts and fairs. 16. The Great Northern Town Site – A recent expansion of downtown Helena with shops, convention facilities, a carousel, and a science museum for children, ExplorationWorks. 17. West Side Mansions – A neighborhood of astounding architecture that reflects the era of “more millionaires per capita than any city in the country.” Walk it with a guidebook in hand. 18. Carroll College – Helena’s Catholic liberal arts college, Carroll accepted its first student in 1909, and has since grown to 1,350 students. 19. Benton Avenue Cemetery – Wooden markers and stone tombstones dating back to 1867 tell of Helena’s pioneers. 21. Brewer’s Baseball – Let’s play ball! Cheer the Brewers on while eating hotdogs and watching the sunset on the mountains. Kindrick Field is straight north of The Sanders, at the end of Ewing. 22. Spring Meadow Lake – This state park is great for fishing, swimming, birdwatching, canoeing, and walking. 23. Archie Bray Foundation – This internationally acclaimed site is dedicated to the enrichment of the ceramic arts. It provides an environment for artists to study, as well as a gallery, community classes and a clay business. 25. Queen City Ice Palace – A great place to visit on one of those hot summer days. The 41,000 square foot Ice Palace offers open-skating sessions and skate rentals. 26. Klefner Ranch – Located in East Helena, the ranch proudly boasts of one of the largest old barns in the country and a charming octagonal stone house. Tours can be arranged. 27. Gates of the Mountains – This 17-mile guided boat tour goes through the spectacular Missouri River Canyon, which was the route of the Lewis and Clark expedition. It was christened the “Gates of the Mountains” for the cliffs that appear to “open and close” passage on the river. 28. Marysville Ghost Town – While thriving as a gold camp, Marysville was home to more than 1,400 people whose economy depended on the Drum Lummon mine. Most of this mining town has been destroyed by fire. However, there are still about 85 residents and a restaurant, Marysville House. 29. Sapphire Mining – There are still many jewels in the Helena area just waiting to be found. Two mines are available for digging: The Spokane Bar Mine and the Eldorado Mine. 30. Canyon Ferry Lake – Canyon Ferry is about 25 miles east of Helena and is a great swimming and boating area for the whole family. 31. Mountain Biking – Here is a popular way to explore Helena, both in town and in the hills and mountains nearby. 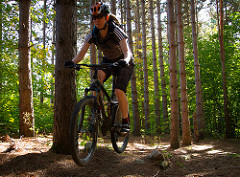 Helena is rated Mountain Bike Silver Level by IMBA. 32. Golfing – Helena has two public golf courses: Bill Roberts and Foxridge. Both courses have 18 holes and include driving ranges and putting greens. 33. Tennis Courts – Check out one of Helena’s many tennis courts for a good time and a great workout. Try one of these locations: Civic Center, Barney Park, Lockey Park, or Capital High School. 34. Fishing – You could fish all year long in Montana. Check out one of the countless fishing spots in the Helena area. Local Orvis shops and sporting goods stores can provide details about licenses and regulations. 35. Ghost Towns – Helena used to be the hub from which roads and railroad spur lines once radiated to mining towns and mountain camps all over the state. Try Elkhorn or Marysville. 36. Antique Shops – Take a look into the past at one or more of Helena’s many antique shops. These shops are located all over town and are full of treasures to be discovered. 37. Hiking – Opportunities abound, on Helena National Forest lands and the trails of the South Hills which have been protected by the city of Helena and the Prickly Pear Land Land Trust. 38. Athletic Clubs – There are four health clubs in the Helena offering a variety of cardiovascular equipment as well as weight machines, running tracks and pools. 39. City Parks and Playgrounds – Parks are scattered all over Helena. Try the Central School playground located only one block away from The Sanders. 40. Movies – The Myrna Loy Theater is within walking distance from The Sanders. The Cinemark 8 Theater is north in the Great Northern Town Center. 41. Art Galleries – There are many art galleries in Helena including several in the downtown area.